It was born in Sydney, Australia two years ago. Just over two million businesses and homes shut off the lights for an hour. Last year: the worldwide initiative reached over fifty million. 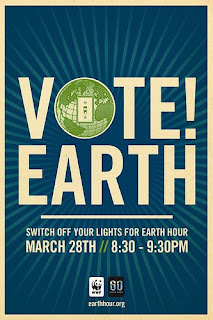 Today over a billion people will turn off their lights for an hour as part of a global vote to save our home – Earth. Whenever we hear naysayers quip we can’t do it, think of today. Whenever we have to endure negative comments that cite the lack of the human collective to join hands and accomplish the impossible, think of today. Earth Hour is social media and the medium is Earth. From two million to over a billion in just two years. That is the power of the human spirit. That is you and that is me. At the core of social media is our hierarchy of needs. It has absolutely nothing to do with a particular website or profile design. It has everything to do with the connection of human beings and our need to belong.